Today I’m introducing you to one of my dear friends, a real life friend, who recently spent her summer traveling with her family. Carol is the mom of four and has two stories to share about her family’s summer vacation. 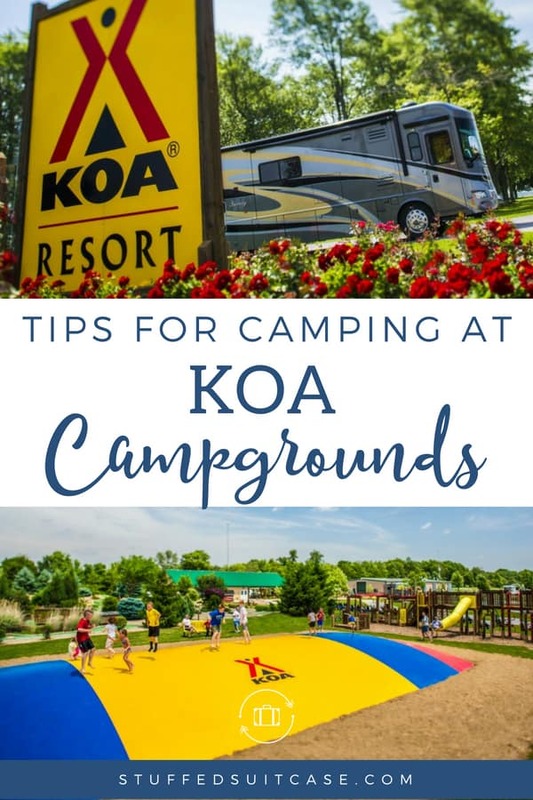 Today we’re going to learn her best tips for KOA Campgrounds! KOA camping can be a fun experience for the whole family so find out what she loves and what travelers need to know before their stay. Tips for camping at KOA Campgrounds. I will always remember the Summer of 2014 for our Road Trip Across America. For five weeks, driving over 8000 miles, we saw America. There is much to tell about such a trip, but here I will give my thoughts about Road Tripping KOA style. KOA stands for Kampgrounds of America. They used a K instead of a C, which is what you should use when spelling the word Campground. I guess if I’d started the business it would be called COA, but they didn’t ask me. Importantly, they got the America part right. There are over 480 KOA campgrounds in America. KOA was founded in 1962 by a Montana businessman who built a campground on his property for people travelling to the Seattle World’s Fair. So you might say that the Space Needle AND KOA are TWO good things we got out of the Seattle World’s Fair. Here is what I LOVE about KOAs. 1st – It is easy to make reservations. Last February I sat at my computer with the KOA Directory and made all of our reservations online. It was easy. If you’ve ever tried to make camping reservations at a state or national park, it may not have been so easy as they may not take reservations until a certain date, at which time EVERYONE calls to make their reservation and you end up on hold for a long time. 2nd – The KOA two room cabin. I love it! It fits my family perfectly. We have four children, and you may not be aware, but many hotels will not allow six people to sleep in one room. IF we were traveling with hotels, two rooms per night would annihilate our budget. The two room cabin generally has one room with two bunk beds, and one room with a double bed. Perfect for us. And many of them have air conditioners, so after we spent the day sightseeing in Washington, D.C., we returned to a cool, comfortable cabin. It was nice. Most KOAs have a swimming pool. Some have a game room, putt putt golf, crafts, a Jumping Pillow (like a big trampoline), and an outdoor movie at night. My 7 year old daughter LOVED swimming in the pool each night, and my teenage son really enjoyed the mini-golf. After hours of driving, it is SO nice to get to a kid-friendly place where the kids can run around and have fun. There is a lot to love about KOA Campground camping. You can rent a cabin, bring your RV if you have one, or you can reserve a tent site and sleep in your tent. We brought our tent and planned to do more tent camping – but as our trip progressed and thundershowers appeared in the weather forecasts, we changed some of our reservations from tent sites to cabins. We appreciated sleeping on the cabin beds, avoiding the extra work of tent camping, and the cabin cost still stayed within our travel budget. I love KOA Campgrounds. My family stayed in 15 different KOAs on our cross-country road trip, and there’s a lot to like about them. But I’m going to be upfront and clear that if you are a traveler, there are three things you may not like. 1st – They can be noisy. Many KOAs are located right near a major highway. This is good and bad – good because they are so convenient for the road tripping traveler to find and get to. Bad because you can hear the highway noise all night long. But if you’re like me and quite tired at the end of the day, the noise won’t be too troublesome. Lots of activity, and possibly noise, at KOA camgrounds. 2nd – You may not have much privacy. Occasionally a KOA campsite will have you tucked away into your own little forested area, but more often than not your campsite will be closely adjacent to the other campsites. When we arrived at the New York KOA there was a big family gathering at the cabin next to ours, so we felt a bit exposed as we stepped out and unloaded our van to the watchful eyes of a dozen spectators. This is not unique to KOA – in ANY campground you will be sharing the bathrooms and shower facilities with the other campers. Thirty five days of public bathrooms got tiresome for me, and as you are sleeping peacefully in your sleeping bag at 2:00 am and your child whispers in your ear, “Mom, I have to use the bathroom…” you will need to rise and walk the walk to the facility, sometimes close, sometimes not so close. On the upside, this is a good opportunity for star gazing. Let me add here that my family was traveling in a Dodge Grand Caravan with a cargo box on top. IF you have the luxury of traveling in an RV, the bathroom issue may not apply to you. If you have unlimited wealth or must travel in luxury, then KOA camping might not be for you. But if you’re traveling on a budget or traveling with kids, KOA camping could just give you the adventure of a lifetime. I love KOA campgrounds…and have stayed at many over the years! I agree with some of your negative points, and I have also found that not all KOA’s are the same. Just because it has a KOA name behind it does not mean it is going to be the same caliber as a KOA down the road. Some are definitely better than others! KOA San Diego Metro has tent and RV sites, as well as furnished cabins. Their RV sites have full or partial hookups. They provide 20, 30 and 50 amp electrical connections. Sites can handle up to 70-foot pull throughs.